Flatten burgers out to 4cm thick dics. Heat grill/BBQ or pan to medium-high heat and lightly oil. Cook burgers for 5-10 minutes each side, until cooked through. Meanwhile, on a low heat, grill haloumi in butter until golden. Grill the bacon slices and set aside. Lightly toast and butter burger buns. Fry the eggs (use egg rings if you want a consistent size), you want them cooked but yolks runny! While the eggs are finishing, start assembling the burgers. Start with lettuce, Jarlesberg cheese, lamb burger, tomato, avocado, haloumi and bacon. 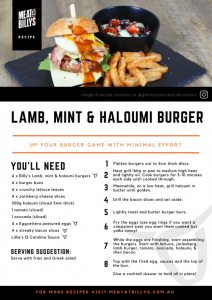 Place the finished burger on the plate, add a good serve of Greek Salad in a small bowl and a generous handful of fries..